The Governor Hindmarsh, Tue 20 Feb. Stiff Little Fingers hit town this evening for what ought to be a rollicking good night at The Gov. It’s a pretty decent audience by the time the band members make their way onto the stage. The show starts at breakneck speed. Wasted Life, Just Fade Away and Straw Dogs fly by before frontman Jake Burns greets the crowd. “Thank you very much,” he says. “It’s nice to be back.” Newer songs blend perfectly with those from “back in the dark ages” and the audience is receptive to everything the band presents. Punk with the odd strain of reggae; it’s classic SLF. Original bass player Ali McMordie and Steve Grantley (drums) provide a perfectly busy platform; both step into the musical spotlight on more than one occasion. Ian McCallum’s electric guitar joins Burns’ guitar and vocals to complete the familiar sound. Burns is happy to talk; he shares stories of his life and music, but there’s no doubt that tonight is all about the songs. A searing version of When We Were Young has the crowd singing along, not for the first time of the evening. It appears that most of the people know the words to most of the songs, which is pretty impressive. Strummerville, Burns’ tribute to the lamented Clash City Rocker, follows. A strong finish sees Nobody’s Hero, Tin Soldiers and Suspect Device close the set. The encore includes memorable versions of Johnny Was, Gotta Getaway and the fabulous Alternative Ulster. The band shares a group hug and then waves goodbye. This has been another great show by a band that knows its stuff. 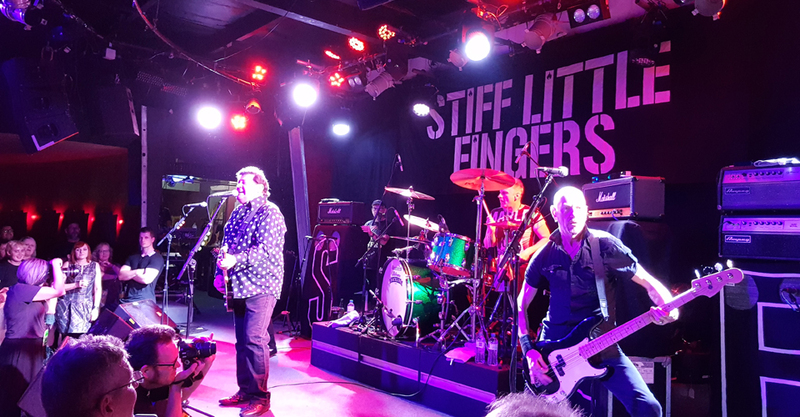 Adelaide audiences should feel blessed that fantastic acts like Stiff Little Fingers choose to tour Australia, because so many of them didn’t back in the day. We need to embrace these bands while we still can.